Design your perfect French door to open your home into the outdoors. You can build your product online within minutes to get a guideline quote. Find out more by calling or emailing us today. Choose uPVC French doors to open your home in Kenilworth, Leamington Spa, Warwickshire and surrounding areas to the outside in style. Our Kommerling range will surpass your design and performance expectations. Different profile options can be selected, depending on your design requirements. Whichever style choice you make, your new uPVC French doors will make your home safer and warmer – not to mention even more appealing to buyers. Your uPVC French doors can be tailored to suit your home improvement aspirations. They can also be used as a front or back door – in your home, conservatory, orangery or house extension. There are virtually no limits with this stunning system. We will install uPVC French doors that will keep the warm air and the cold drafts out. You’ll benefit from a lower U-value that drives down your running costs, while turning your chosen room into a space that can be used all year round. This is all thanks to the 5-chambered insulation system that comes as standard. Every home is unique, which is why the design of your uPVC French doors needs to be tailored to suit its environment. Select from our stunning catalogue of foils and woodgrain textures, then perfect the performance of your installation by reviewing our wide selection of hardware and accessories - you'll be amazed at the results. uPVC French doors can be used as front or back doors. They will work just as well in a home, conservatory, orangery or extension - so your choices won’t be limited. The clean and modern sightlines produced by your doors’ sightlines will make it an eye-catching feature, wherever you decide to install it. Your uPVC French doors have been exposed to rigorous testing to ensure exceptional performance, no matter what the weather might be doing. Once installed by Fox Windows & Doors, your back doors will reward you with superb aesthetics and won’t deteriorate in response to rain, wind or temperature. We have in-depth of the Kommerling uPVC door range. We have completed a number of successful projects in Kenilworth, Leamington Spa and the local areas - so you can ask us for advice, knowing that we have the experience to complete the work to your total satisfaction. Call us or get an online quote today. Buy your new uPVC French doors from us, knowing that they have been manufactured to minimise harm to the environment. The Kommerling range is lead-free - so you’ll be able to enjoy the benefits of your installation with peace of mind. Contact us to find out more about the benefits of this range. If you have a query about our French doors in Kenilworth, Leamington Spa, Warwickshire and surrounding areas, please email or call a member of our team with your question. We’ll be able to help, provide and a quote – and even come and see you for a more detailed discussion. If you’re after prices only at this stage, visit our online door designer tool. Build your preferred product within minutes and get a free uPVC French door quote for your home improvement project. 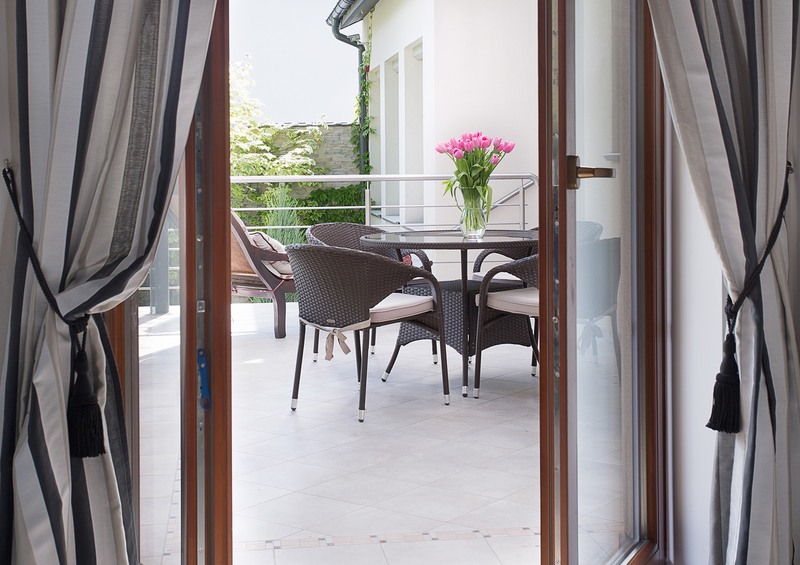 uPVC French doors can be opened and closed to let the outside in when you choose. If you prefer some privacy, the world can be kept at bay. When entertaining during an evening – or if you want to catch a passing summer breeze – you can open up your room or conservatory to your garden. uPVC French doors can work in a range of scenarios. Use yours as a backdoor or as an entry point into your garden via an extension. Our Kommerling range looks modern and fresh and will add market-appeal to any area of your home, especially when customised to suit your themes and schemes. Our uPVC French doors will keep your home or extension warm when the colder weather sets in. You won’t need to worry about heat escaping or cold drafts penetrating and can, instead, sit back and relax – knowing that your installation is also contributing to lower energy bills. Invest in uPVC French doors that will survive even the worst weather. uPVC is a strong and resilient material; it isn’t prone to rotting or warping like wooden doors, either. Our Kommerling doors are also easy to maintain and keep clean, so you’ll be able to spend time on other important matters. Build a uPVC French door that will look and perform to the standards you need for your project. Design your dream door in minutes and get a competitive quote.